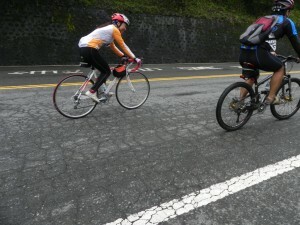 Every few months or so, large groups of cyclists take on the He Huan Shan ride. 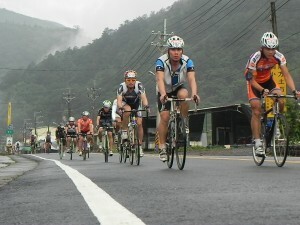 Every weekend you will likely see small groups and many solitary riders making their way upwards. It’s part of the San Heng Yi Siu (三橫一豎) the ‘trinity’ of Cross-Island highways — North, Central, and South -that cyclists often like to compare notes about. This includes whether or not you have completed some or all, and, of course, what hellish ordeals you might have gone through in being able to claim you have been successful. 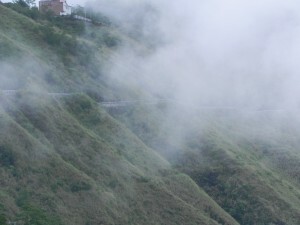 One half of the Central Cross-Island Highway the road climbs from an altitude of around 450m at Puli to 3200m at the pass at Wuling, affectionately referred to amongst cyclists as Tie Pigu (鐵屁股). 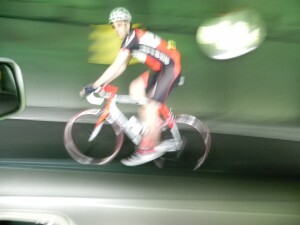 The distance is around 55km putting the average grade at 5%. Since the real climb starts around 15km to the East of Puli, the first 15km being a gentle 2% or so, the average grade for the ‘real’ climb is 7% average. 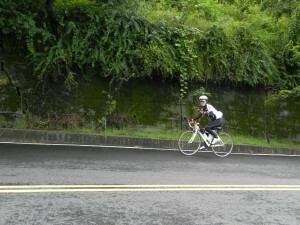 There are a few places that level out and even a short 1.5-2km downhill very brief respite. But many sections are made of an unrelenting series of 10%, 12%, and a few 15% portions, especially over the final 10kms to the pass at Wuling. 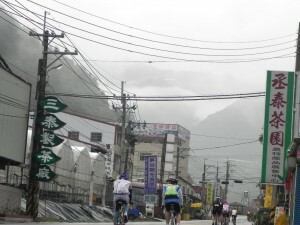 The route can be divided into several stages: 1. the first 15km to the start of the climb, altitude around 700m. 2. 10km to Ching Jing Farm at around 15oom 3. 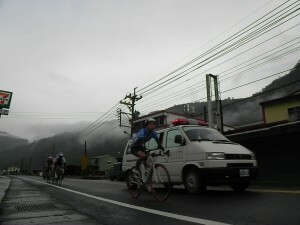 10km to Cui Fong 4. the final 15km topping out at 3200m. This begins moderately out of Cui Fong, but quickly turns into the test of how much iron you actually do have in your backside and in your soul. 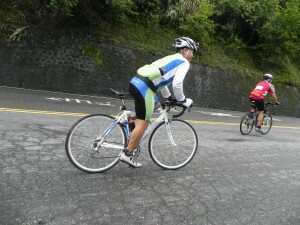 Last weekend the Nantou county government had their 2nd annual celebration of this great ascent. Over 2000 cyclists on road bikes (majority), mountain bikes and a very small minority of “mini” folding bikes assembled at 5am to begin the challenge in groups, starting at 5.30am. 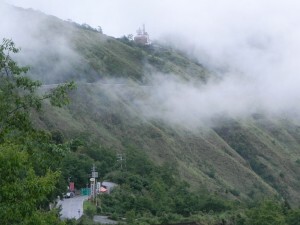 The day was heavily overcast with rain overnight and continuing drizzle. 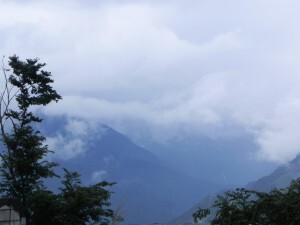 The cloud was low, clinging to the valleys and shrouding the peaks. 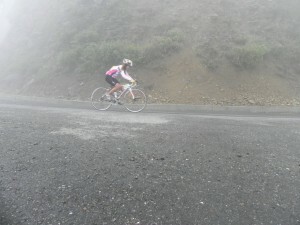 Luckily the rain held off . . .until later in the day past 2,300m. My job was to support a group of riders from one of my dealers. 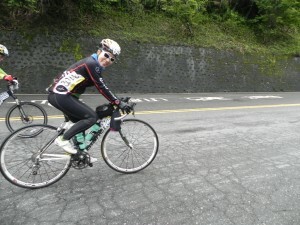 They are a seasoned group of cyclists who have done this a few times and know how to prepare. Soyjoy bars, snickers, energy drinks were all available for anyone who needed them, as well as an essential toolkit. The organizers also had a number of snack and water stations along the route–a well-organized good day. 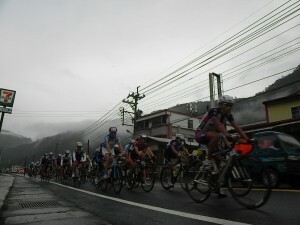 I parked at the last 7-11 on the route a little before the first climb to Ching Jing Farm and took shots of the leading group of riders. Warning! Lycra ahead. 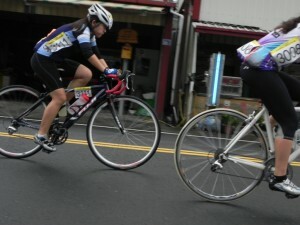 . .
Strong riders vying for the top placings. Several ambulances were on patrol. They are usually always required with groups this large. The rider in the center on his Festino,” The Kid”, 15 yrs old, one of two riders from the group of 12 to make it all the way. He made it relatively easily where many others were defeated. Top job! 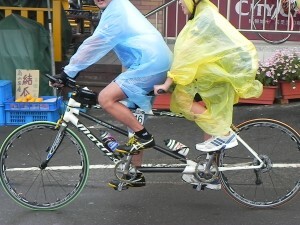 This contender was one of the very few on his folding bike. Thoughts focused on the ordeal about to begin. 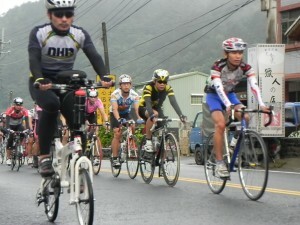 Many cyclists will say that the Tie Pigu challenge is decided in these first 15km. It is too easy to go just a bit too hard, caught up in the enthusiasm of the crowd and the thrill of the day ahead. It’s good to pace yourself through here, because what you lose here can make that last 10km impossible. 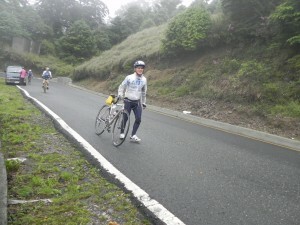 Henry was the other rider from my group to make the climb. The first stage of the climb towers overhead. One of several ladies to give it a go. She leads a pack into the challenge. 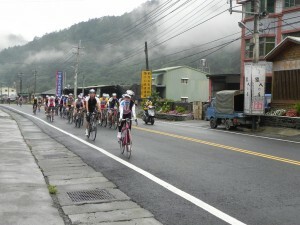 First stage of the climb to Ching Jing Farm. She’s still smiling. And then along came a lady on one of my GP1’s. 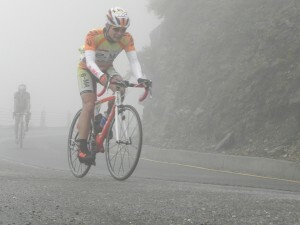 Da Ge tackles the climb. 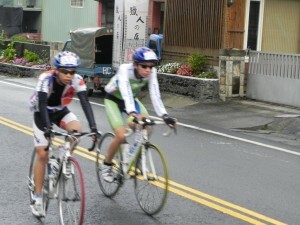 The only lady in the group I’m supporting, Shiou Yu, is looking relaxed and riding well. If she knew that a ghost rider was just up ahead in a tunnel, maybe she’d be a little less relaxed. Having reached Ching Jing, The Kid takes a drink before things get really serious. A little ahead of him, Henry is climbing strongly at 16oom. Half way to target altitude. A little over half way to the finish. He’ll soon be in Cui Fong. This is the view from Cui Fong. Out on the exposed flank of the mountain the grade is relentless to the finish. A closer look. There’s around 10kms of this. Road warrior getting close, but the cloud closes in. The temperature that has been continually dropping hits 10C. The rain begins. Ema, a strong team on any climb. This is not unusual. Many are broken on the last stages, often just sitting exhausted by the roadside, the only way to go being down. Speaking of down, I’m not sure how far they made it up, but a tandem is something you don’t see very often up here. The mountains are just awesome. There’s more to say and show about this climb. But that’s for another day. Great coverage of the riders…..nice. I’d love to take on that climb one day. I sure hope I can get over there to ride with you in the future. More than welcome Darryl. 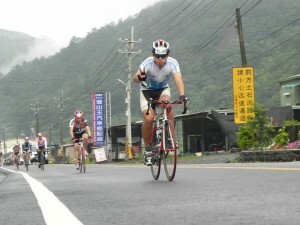 I hope in the years to come more international cyclists will come to enjoy the varied cycling environments that Taiwan has to offer. Excellent report! I know a few people who made it up. I actually forgot to register and will have to do the next one in September. 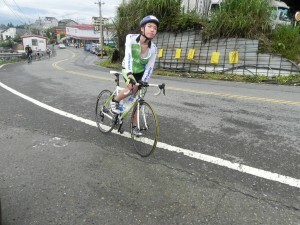 Luckily we will be doing it from the Hualien side in three weeks. I love the scenery up there.